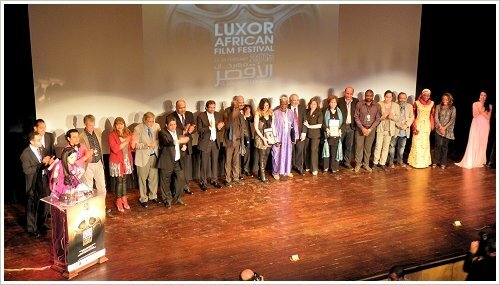 The 2nd Luxor African Film Festival concluded on 24 March 2013 with a grand closing ceremony at the Luxor Conference Hall as well as with dinner party and presentation of prizes in Medinet Habu Temple. The Grand Nile Prize (including prize money of 10,000 USD) for the best film of the festival was awarded to "Hidden Beauties", a film of the Tunisian director Nouri Bouzid, which was shown in the course of the festival on the 19th of March, 2013 in Luxor and had its world premiere in October, 2012 at Abu Dhabi Film Festival. Bouzid developed the basic idea of the film before the revolution in Tunisia. It became a novel about two young women - one who wants to lose her virginity and the other, who refuses to pretend that she is still a virgin. However, as after the revolution wearing the Hijab (a veil which covers the female head and body) became a form of a political statement in Tunisia (a country in which wearing the veil was almost forbidden!) Bouzid changed the subject of his film but kept the main structure. The film "Hidden Beauties" (original title: مانموتش "Manmutish", literally: "Don't die!") turns on two young women in Tunis after the fall of the regime. Zainab and Aicha are best friends and work in a bakehouse connected with a café. Zainab is engaged and doesn't wear a headscarf. She works as a waitress "upstairs" in the café. Aicha works "downstairs" in the bakehouse. She is friends with Zainabs brother Hamza, who has just managed to escape from the prison. There, he has become a fundamentalist. He regards Aicha's headscarf with favour, however, criticises his sister's way of life vehemently. Now the following happens: The two women, who made their very own decision on wearing the headscarf or not, are compelled to do the exact opposite. Zainab's fiancé Brahim, who lives in France, requires her family to press her to wear the headscarf (under the pretext his mother would demand it) - otherwise he would have to break the engagement. In order to overcome Zainab's resistance her mother jails her in her bedroom, so that she can't go to work, puts opium in her daughter's tea and makes Zainab's favourite aunt to show up and put the scarf on her head - sometimes with gentle pressure, sometimes with violence - all that in order not to put the engagement at risk. Aicha is the favourite employee of her boss. When Zainab doesn't come to work any more, he blackmails her with smooth as well as harsh words to take her place as a waitress in the café - what is tantamount to take off her headscarf or to lose her job. which allows her and her sisters to survive. What it means, too, we can watch in a scene in which Hamza stands on the café's gallery. He observes with horror the male customers touching the waitresses - sometimes secretly, sometimes intrusively. Now one could mean, Aicha's and Hamza's relationship is without problems because they agree on wearing the scarf. However, Aicha can not get along with Hamzas Islamistic position, which cuts women's rights drastically, and Hamza can't cope with Aicha's desire for mobility and freedom and the fact that she is working. After a while Aicha gives up, takes off her scarf and let her colleagues apply make-up to her face. However, after a look in the mirror she becomes violently angry and throws flour around - an impressive scene. Aicha refuses to be blackmailed. As well as Zainab. She prefers to break the engagement. 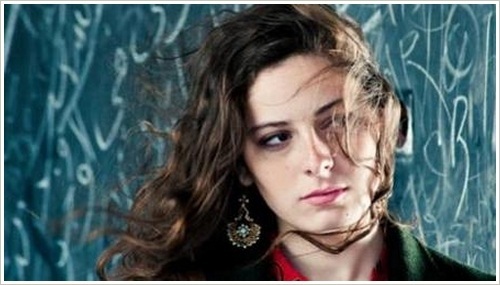 In 2012, Nouri Bouzid was awarded with the prize of the Best Director of the Arab World at Abu Dhabi Film Festival. During the regime of Ben Ali he was jailed for five years because of his political activities. In his film "Hidden Beauties" he plays the role of a blind accordionist, who falls victim of the revolution, himself. At the end of the film Zainab and Aicha sing his song: "I don't want to die before the misery in the boys' eyes disappears." 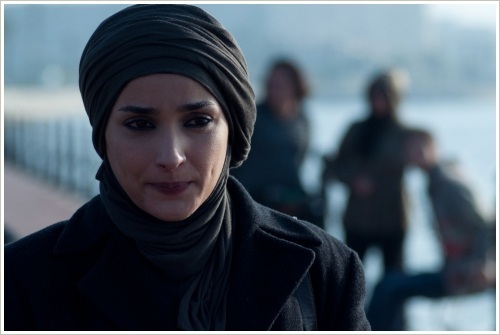 Bouzid's message:"My goal with this film is to try and showcase that the wearing of the veil, the practice of Islam, and every other choice is one that is personal. Respect personal choices, respect other cultures, respect people. Respect is key." 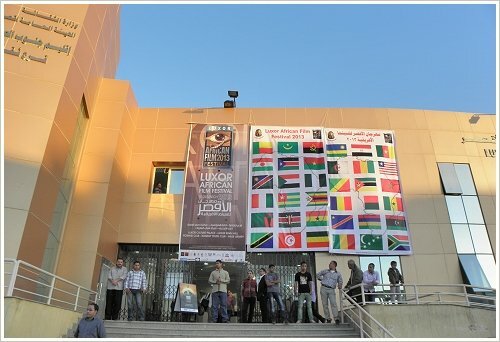 Yesterday evening, the opening of the 2nd Luxor African Film Festival took place at Luxor Cultural Palace. After a musical performance several speakers - amomg them the President of the festival Sayed Fouad El-Genary and the Gouvernor of Luxor Dr. Ezzat Saad - welcomed the audience in the fully occupied hall. 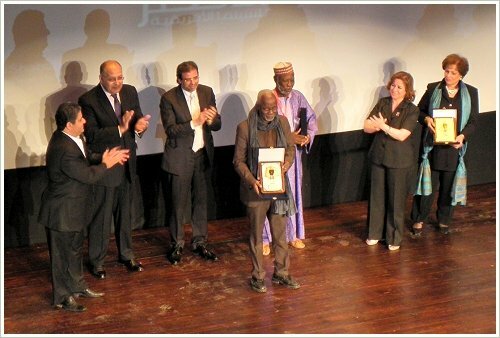 Then, the jurors of the 4 film competitions were presented and prominent Egyptian and African artists were honoured. 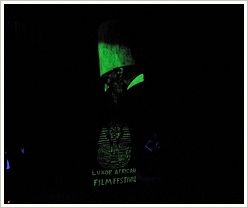 Associated with the Luxor African Film Festival, 39 young artists of the Creative Forum of Upper Egypt exhibit their works at the Luxor Cultural Palace until 24 March 2013, from 10 am to 7 pm - another effort to decentralise the Egyptian arts and cultural scene. 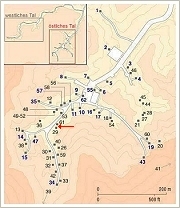 During clearing work between the undecorated tombs KV29 and KV61 in the Valley of the Kings (the tomb owners are still unknown), a team of the Egyptological Seminar from the University of Basel under the direction of Prof. Susanne Bickel found an ancient sundial, one of the oldest of its kind. 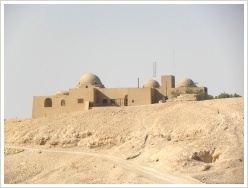 In 1300 BC, there were stone huts in this area used to house the men working at the construction of the pharaonic tombs. 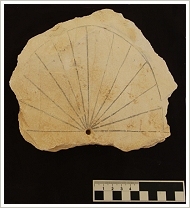 The sundial, which consists of a semicircle divided into 12 equal segments and has a diameter of 16 cm, was drawn in black colour on a flattened piece of limestone (so-called Ostracon). A dent for the bolt that would cast a shadow and small dots for more detailed time measuring are clearly recognisable. The sundial could have been used to measure the work hours or to further study the path of the sun-god and visualise it in the funerary texts. Yesterday, the Egyptian Ministry of State for Antiquities announced the find: The international mission working at the area of the destroyed Mortuary Temple of Amenhotep III discovered 14 black granite statues of the ancient Egyptian lion-headed Goddess Sekhmet. The well preserved seated statues are about two metres high and were moved immediately in order to protect them. In the past, the mission made many important finds (see our news of 02/03/10, 22/03/10, 17/05/10, 02/10/10, 16/12/10, 27/04/11, and 31/05/11) and plans a virtual reconstruction of the temple showing the original position of all finds. During the reign of Amenhotep III hundreds of statues of Sekhmet were raised. Some Egyptologists guess that he attempted to avert diseases or pests because the destructive goddess was considered as a healer, too. 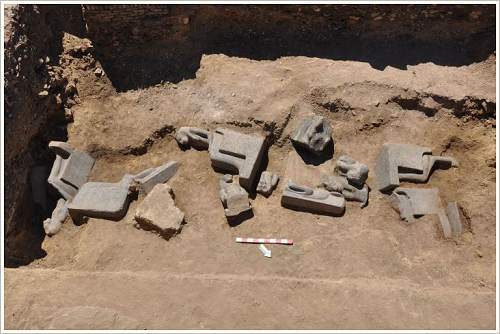 Recently, a Sekhmet statue was found at Mut Temple in Karnak (see our news of 15/01/13). 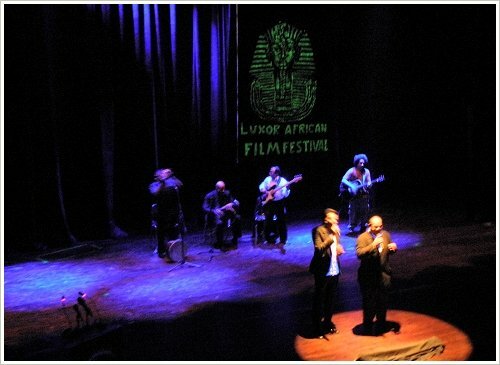 Due to financial issues the 2nd Luxor African Film Festival had to be shortened. It will start not until March 18, 2013. The opening ceremony will take place at the Luxor Cultural Palace (either 6 pm or 7pm - the details given on their website and facebook page are divided). At about 9 pm the film "War Witch" ("Rebelle") shot by Kim Nguyen in Congo will be screened and not as scheduled "A Screaming Man" from Chad. The film festival will end as planned on March 24, 2013. 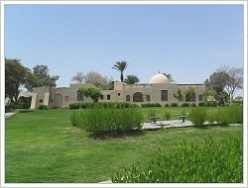 The venues are: on the east bank the Luxor Cultural Palace, the Luxor Conference Hall as well as the Rowing Club at the Corniche and on the west bank the Be'irat Youth Yard. I was told that a printed programm will not be available until the beginning of the festival. The admission is free, no tickets are needed. 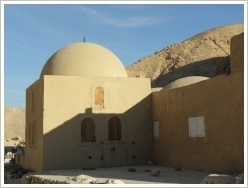 On Sunday, March 17, 2013 7pm Marcel Maessen will lecture at the Mummification Museum on “A Home away from Home - Living accommodations of the early Egyptologists". Together with his wife Monica Marcel started the t3.wy Project in 2009. 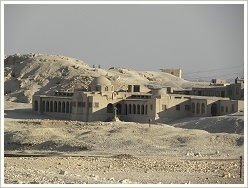 It aims to locate all dig houses in Egypt, doing research on their history and document it. For the Luxor area these are among others: the two houses of Howard Carter (Castle Carter I and II), the Insinger House, the de Garis Davies House ("Beit Nimsawi"), the Theodore Davis House, the Metropolitan Museum of Art House (now: Polish House "Beit Bulandi"), the Stoppelaëre House and the Waseda House. A hot-air balloon flight over the temples and burial grounds of the pharaohs at sunrise indisputably ranked among the highlights of every Luxor trip. Ranked - , for on 26th of February, 2013 at about 7 am a calamity claimed the lifes of 19 people. Because we still receive questions for details, we would like to describe the cause of the accident according to present knowledge. All together there were 21 people (primarily tourists) including the pilot Momin Mourad Ali aboard the balloon of Sky Cruise. On the 13th of February, 2013 the balloon, made in 2008 by the Spanish company Ultra Magic, had to pass through security checks for three days. It was completely insured. Obviously, a rope damaged the leads of the gas cylinders during the attempt to land, which in turn sparked the fire. The gas canister exploded and yanked the balloon up to 400 metres at a tearing pace. When the balloon burst subsequently, the basket with the passengers crashed into a sugarcane field beside the village of El-Dhabaiya near Al Moudira hotel. Currently they suppose that the pilot could have prevented the accident by closing the valve for the gas supply. Only two people survived the tragedy - severely injured: a British tourist and the 29-year-old pilot. 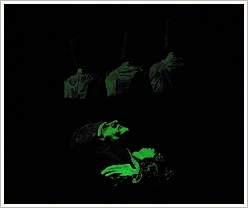 He is currently treated because of his burns of the third degree at a military hospital in Cairo. The reports concerning him are contradictory. At the moment it is unclear whether he really jumped out of the burning balloon as often reported. By the way, every pilot has to pass an official training and regularly to undergo security trainings of the Civil Aviation Authority at the Luxor Airport. The governor of Luxor Dr. Ezaat Saad stopped all balloon flights until further notice. After a balloon accident in April 2009 (16 people had been injured), the safety measures had already been tightened. On 1st of March, a memorial service took place at the scene of the accident, which was well attended. Our deepest sympathy goes to the injured and to the family and friends of the deceased. Out of respect for their grief we go here without the usual photos.